This weekend I’m participating as a guest of the Local14 Art Show! Tonight is the gala 50th Anniversary Opening reception, from 6-9 pm. $10 admission gets you a great night out with catering by Elephant’s Deliand first access to the bounty of wonderful art presented. 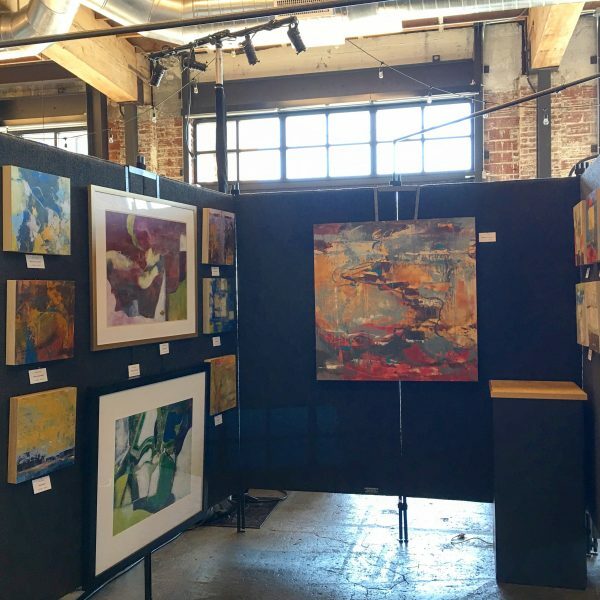 The show is open September 28 – October 1 at the Left Bank Annex in NE Portland. Friday, September 29, 2017, 10-7 p.m.
Saturday, September 30, 2017, 10-5 p.m. There are 2 levels to this great industrial space, so don’t miss exploring all the show has to offer. You can use the bucket style elevator or the stairs to move between levels. There is so much to see, you’ll want to spend some time here! I’ve created a special box set of 4×6″ notecards for this show and Portland Open Studios. Each set contains 2 each of 4 different designs. I can’t wait for you to see them! They’ll be on the small pedestal you see in the photo above. Local 14 began 50 years ago when 14 women artists decided to host a show in a garage in Lake Oswego. ‘Local’ is an acronym for Lake Oswego Crafts and Arts League, and 14 denotes the original 14 members. The group uses this show to raise funds for arts scholarships for deserving college students. This year, they have awarded $10,000 in scholarships to 4 deserving students. The scholarship winners will have work on display during the show.